One of the most common questions a new Montessori parent asks is, how can I make my home more Montessori friendly? Most parents don’t realize they can make some minor adjustments to their homes to start incorporating more Montessori right away. In this post, I’m going to be showing you exactly how to create a Montessori prepared environment at home. Minimalist living and Montessori go hand in hand. The simpler the environment the better your child’s concentration is. Sensory overload is a common thing these days and needs to be taken into consideration when setting up your main living space. With too many options your child will be overwhelmed. It is best to stick with a few materials on display and rotate them out routinely to provide new work. It is very important for children to feel that their home is theirs too. Often as adults, we don’t look at things from our child’s perspective. It is hard to learn independence when you NEED assistance to get into your chair or sit at the table. This is why child-sized furniture is so important. It allows your child to independently do tasks on their own. It also makes them feel including in the family having their own personal belongings. It can be hard to carve out an area just for your toddler if you are limited with space but the benefits are worth it. Your child will feel a sense of pride about their space, keeping it clean and ready for their next project. Having a space that is at their level will help your child feel more comfortable and able to concentrate on his or her work. While this is not a physical component of your main living space it is a good reminder that while your child is young and needs assistance you want to provide them with yes spaces. Give them access to as much as possible. If you have breakable items in their reach, move them. Allow them to explore their world around them by taking out any harmful items and replacing them with child-friendly items. Creating a Montessori prepared environment with new materials doesn’t have to be difficult. When you use educational programs such as Monti Kids the transition is easy! This program is designed to take the guesswork out of finding Montessori materials suitable for your toddler. 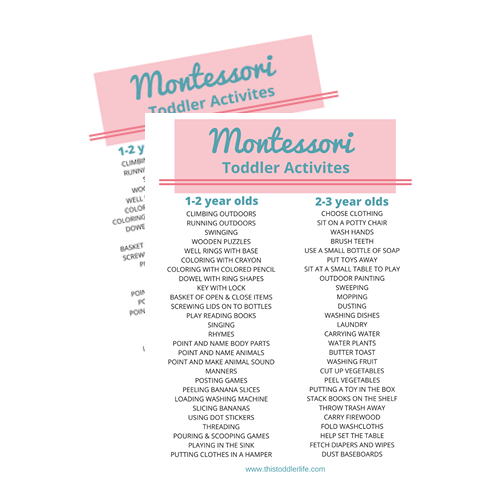 Learn more about Monti Kids and how they can help you have a Montessori home by clicking here! Use the promo code TODDLER30 to get $30 off your first order. Have you been able to create a Montessori prepared environment at home? Let me know what works for your family in the comments below! Hi have a large colourful mat in the lounge, a child size table where they can have morning tea, read or sit to play. I use a tv cabinet for their materials. I wonder if I have too much out for them though. I do themed unit studies for them so I have those things out, a box of books, dress up hats, food for cutting (which my son is interested in at the moment), toy animal figurines, toy cars, a fishing game and pirate ships. how much u would have out?